Arsene Wenger and his squad few to the north west yesterday afternoon ahead of today's game against Wigan but not before the manager had faced the media and taken the squad through a light training session. It's fair to say the press conference was a little subdued. There were no hard questions for the manager, all pretty run of the mill in fact. There were no new injury news we hadn't already heard about. The manager spoke at some length about Abou Diaby and the situation he currently finds himself in. 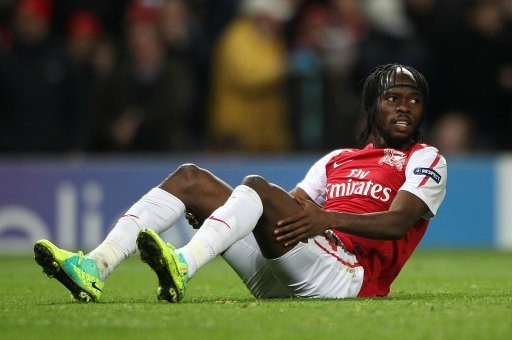 It did sound as though the manager had concerns the Frenchman would ever play again prior to his surgery last summer. That was certainly the impression I got when Wenger spoke last October about the situation following yet another injury set back following our defeat at Stamford Bridge where Diaby got injured following a poor tackle. The injuries aren't Diaby's fault. And I have to correct fans when they say he's a problem. The only reason why he's had so many injuries is because of the horrendous challenge by Dan Smith - I won't call it a tackle because it wasn't one in my eyes - during the game with Sunderland in May 2006. Many of the resulting injuries have been down to complications following that injury. During the summer the midfielder went away to play for France rather than have surgery straight away. That is the only question I have about the latest situation. Why let him play for his country when he's scheduled to have surgery which will leave him missing pre-season and the start of the campaign for his employers? Had he not been playing for France that time would have been reduced and we might have seen him playing more regularly by now. I suppose that is by the by now. Those 22 minutes against Fulham have caused a reaction and now the player is out for a further ten days after working hard to regain his fitness following surgery. "He got injured again and it’s a minor injury but at the moment I must say he is very low because he has put a lot of effort in to come back. "He has not played one game since the start of the season and he is going through a very difficult moment just now because he has put so much dedication into his rehab. To be injured straight away again is very difficult to take for him. He has been out many times like that." I don't believe the manager wants to give up on the player. He really believes that Abou can over come the latest injury problem - after all it's only a minor set back - and fulfill his potential at the club. Personally I've had my frustrations with watching Diaby play. I think he slows our game down too much. But when he's at the top of his game, he's a fantastic player to watch. I really hope we see him back to his best. It would certainly be good for the manager to have a positive Diaby problem to worry about - where to play him in the team and who would be left out. At the press conference the manager shut down the Marco Fabian de la Mora story which had been doing the round in the Mexican press. He also said he wasn't on the market for a striker in January. Although he did say he wouldn't rule out signing a "fantastic player" in the transfer window - if he found one. So to this afternoon's game. Wigan hasn't been the most friendliest of grounds for us to visit since Roberto Martinez took charge. A draw last season and a defeat the season before. Today I predict will be different. This Arsenal team have a different character. I think we'll see Koscielny start in place of Mertesacker following his midweek master class which should cement him in the manager's eyes as a starter. I have nothing against the German and think he'll be a fantastic player for us. I just believe at this point in time the Koscielny/Vermaelen partnership is the form pairing. Both players are playing at the top of their game. Today will be my first away match of the season and I'm really looking forward to it. I've never been to Wigan before and I hope my first experience is a good one. No doubt I'll be tweeting from the ground later, so follow me if that's your bag. And for some extra reading, there is an good interview with Gervinho in today's Guardian and offers this advise to the manager about signing Eden Hazard. "I would advise Mr Wenger to get Eden to pack his cases and come here. His game would really suit Arsenal's." Where ever you are watching the game enjoy it. Let's hope the curse of the live screening at the stadium doesn't strike again and we'll be celebrating getting back to winning ways.